If you're looking for steady returns from investments that won't keep you up at night, look no further than these three top stocks. We're currently in the midst of earnings season, one of the four opportunities investors get each year to tap into the inner workings of the stocks they own. Stocks can pop on great news, deflate on unexpected revelations, or shake off ho-hum results as if nothing happened. While the long-term trajectory is what matters most, let's face it: Some stocks have more risks than others. High-flying growth stocks can get punished if they fail to meet their historical growth rates, or if Wall Street holds them to unrealistic short-term expectations. Whatever the reason, waking up to news that one of your investments is down 10%, 20%, or more can be a more volatile experience than you're comfortable with. But risk-averse investors don't need to sacrifice gains. If that sounds intriguing to you, then you may want to consider General Electric Company (NYSE: GE), NextEra Energy (NYSE: NEE), and Repligen Corporation (NASDAQ: RGEN) for your portfolio. Most investors have probably heard of General Electric. Founded in 1892, the company today is innovating in industries and technologies as diverse as biopharma, nuclear power, jet engines, and the industrial internet. The company may be valued at $260 billion today, but it sure doesn't show signs of stagnation. That's especially true after the massive spinoff of its financial-services division fueled a $50 billion share buyback, injected another $40 billion into dividend distributions, and allowed the blue-chip stock to double down on the future of manufacturing. The future is certainly bright. Of course, recent history hasn't been that bad, either. 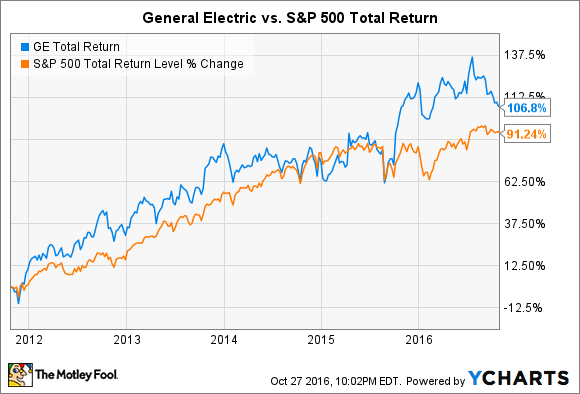 In the past five years, General Electric stock has managed to beat the S&P 500 by 15%, when dividends are included for each, with relatively little volatility. General Electric currently sports a dividend yield of 3.2%, but things are about to get much better. Management has promised to give back $27.7 billion in dividends between 2017 and 2018 -- compared with $12.3 billion between 2015 and 2016 -- as part of the financial-services spinoff. Some of that may be paid out in a special dividend, while some may be added to quarterly payouts in the near future. Either way, the strength of the company's business, and an eye on building infrastructure for the future of manufacturing, make General Electric an ideal investment for risk-averse investors. It may not be a household name yet, but NextEra Energy is one of the leading power generators in the country. The company's operations are broken into two major segments: Florida Power & Light Company and NextEra Energy Resources. The former provides power to over 4.8 million customers in Florida, while the latter is the world's largest generator of renewable energy. That -- and consolidated revenue of $17.5 billion from 45 GW of generating capacity -- earns NextEra Energy a $58 billion market cap. Meanwhile, a history of investments focusing on the long-term transition to clean energy has earned investors a lot of money. 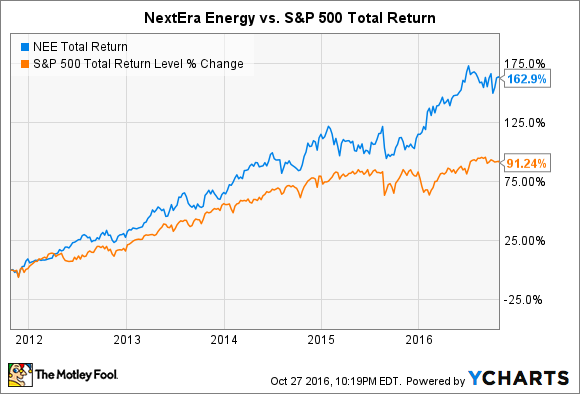 In the past five years, NextEra Energy stock has managed to beat the S&P 500 by 72%, when dividends are included for each, with relatively little volatility. Throw in a dividend yield of 2.7%, and there's not much to complain about. Better yet, the company isn't facing any substantial risks to its operations for the foreseeable future. In 2015, two-thirds of the company's generation assets -- comprising 59% wind, 19% natural gas, 13% nuclear, and 5% solar -- were entered into long-term sales contracts. Continued investments in wind and solar, combined with new state and federal incentives for clean power generation (including nuclear), should keep the growth humming along for NextEra Energy investors. 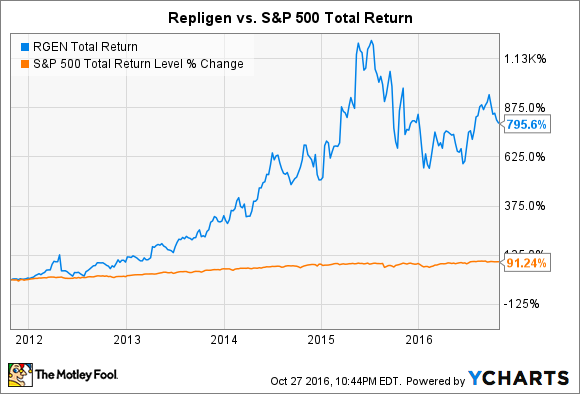 Repligen certainly isn't a household name, and it may never be, but it delivers undeniable value to the high-growth, high-risk biopharma industry. The best part: The company is succeeding by piggybacking on the growth of the entire industry, rather than pinning its hopes to binary outcomes for a handful of clinical trials. The bioprocess company is the leading supplier of a critical reagent needed during the purification step of biological drug manufacturing -- a big deal, considering nine of the 10 best-selling drugs in the world in 2015 were biologics. Repligen has also made timely acquisitions in recent years to add equipment and reagents in upstream and downstream manufacturing processes to its sales portfolio. Despite the incredible growth in recent years, Repligen is valued at less than $1 billion. Given several favorable trends in the biopharma industry -- record approvals for biologics, the emergence of biosimilars, and a focus on cost reductions -- the stock offers a rare combination of low volatility and incredible growth prospects. Risk-averse investors don't have to sacrifice gains or even market-beating performance. It should also be pointed out that all investors can dedicate some of their portfolio to less risky stocks. As General Electric, NextEra Energy, and Repligen demonstrate, these opportunities exist in various industries and with companies big and small.